The services required by the armed forces of the US government are extensive and do not leave much time for these men to build a stable life for themselves. Therefore, they are at a disadvantage if they plan to call a new place home. The US Department of Veteran Affairs (VA) offers a solution for these brave Austin, Texas veterans to finance their home purchase even with their credit history issues, through the VA Home Loan program. Below are a few reasons why VA home loans are extremely beneficial and could help you obtain your next home. Why are VA Loans a Good Choice for Veterans? These loans are financed by independent lenders, catering to the Austin, TX area, such as Core Lending, but are guaranteed by the US Government, and so carry a lesser risk for lenders. Veterans can enjoy countless benefits that allow them to afford these loans more readily. Due to the low credit risk, lenders don’t require any down payment to purchase a home, allowing veterans to save up their funds. While most conventional loans require personal mortgage insurance in such cases for protection against default, VA Home Loans are exempt from any such mortgage insurance payments. Low credit risk also means competitive interest rates on VA mortgages. The final rate is decided according to the veteran’s financial details; they can be 0.5%-1% lower than conventional loans on home values that can go up to $424,100. With such benefits, VA mortgage loans become very attractive to Texas veterans, and in this way, the VA ensures that even the lowest income servicemen and their families can enjoy home ownership in Austin. Who Can Apply for VA Home Loans? Texas VA Home Loans have no lowest income requirement for eligibility, but lenders do check DTI ratios and credit scores to make sure the borrowers can deal with monthly mortgage payments. However, these are low enough to accommodate credit histories that are typically inadequate for conventional loans. The veterans must occupy the home as their primary residence, and VA loan benefits can be re-used. Apart from these general requirements, there are certain specific VA Home Loan eligibility requirements in Austin, Texas as well, which include service in the armed forces for 90 consecutive days during wartime and 181 days during peacetime, or more than 6 years of service in the National Guard or Reserves. Surviving spouses of veterans who gave their lives in the line of duty are also eligible for these loans. To this end, the applicants must provide certain documents to the lenders, which may include Veteran’s VA Certificate of Eligibility, Past 2 years W2 statements, past two months’ bank statements, a copy of DD214 (if the veteran has been discharged/separated from the Military), among other things. Veterans can then discuss their options with our VA Home Loans Specialist. We will guide you through the process and design an appropriate package that suits your needs. If you have not done so yet, we can obtain your Certificate of Eligibility to streamline your loan process. 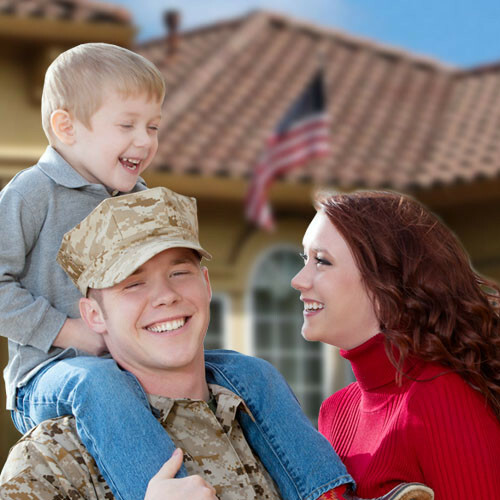 VA Home Loans are a great solution to debt and credit problems faced by US veterans and Military servicemen and their families. It provides a chance of stability with huge amounts of savings as compared to conventional loans, savings that can be much more useful in building a bright future. Call us at 877-561-3064 for a free consultation or use the tools on this website for additional information.